Dr.Malpani's Blog: Should pharmaceutical companies be allow to sponsor medical conferences ? Should pharmaceutical companies be allow to sponsor medical conferences ? There is now a lot of hue and cry about the corrupting influence which pharmaceutical companies have on doctors. None of this is really new, but it is been brought into sharp focus recently . The Parliament wants doctors to prescribe only generic drugs , as compared to brand names , because these are significantly cheaper and equally effective. While there are guidelines laid down for doctors, which specify that they are not supposed to accept gifts from pharmaceutical companies, most of these are observed in the breach and happily flouted. The Pharmaceutical Council has now got into the act , and is tightening the screws on pharmaceutical companies , to ensure that they do not provide gifts and bribes to doctors. Pharmaceutical companies have come in for a lot of criticism recently. They waste a lot of money on developing lifestyle, drugs, which make billions for them , but don't really help to improve the health of people. All the large pharmaceutical companies have been fined billions of dollars , for unethical marketing practices all over the world, which means they now have a very tarnished reputation. Pharmaceutical companies have deep pockets and can be easy targets . The passage of this law will help prevent some of the more flagrant abuses which we have seen for so many years. However, the fact is that laws are not going to make these unethical practices go away. There is just too much at stake , and the marketing departments of pharmaceutical companies are very clever. They have developed ways of bending the law and bypassing it , because they understand how important it is for them to influence the key decision-maker within the healthcare system - the doctor . One of the most important mechanisms of influencing doctors is by sponsoring medical conferences. Pharmaceutical companies will spend crores of rupees to sponsor conferences , because this gives them an opportunity to influence thousands of doctors directly. Many of these conferences have become large circuses , with budgets of over a crore of rupees, pharmaceutical companies compete with each other to lure doctors at these events. One way of plugging a lot of these loopholes is to ban pharmaceutical companies from sponsoring medical conferences. There's nothing wrong with medical conferences per se. After all , in theory at least, they are great ways of ensuring that doctors learn about recent medical advances and keep themselves up-to-date. Unfortunately, this is true only on paper. In real life , most of these conferences are held in five-star hotels and beachside resorts , and end up being parties for doctors , who are happy to socialize with each other , meet old friends; and play political games, rather than learn. If doctors are serious about using conferences for continuing medical education , then they should be quite happy attending conferences held in medical colleges. However, the attendance for these serious medical low-budget , low profile conferences is one tenth of what it would be , if the conference was held in a five-star hotel. Many pharmaceutical companies pay the doctors conference fees for attending these five-star medical conferences. They also pay for their tickets; and pay huge amounts of money for the privilege of having stalls at these conferences , so they can exhibit their wares. Because this has become such a lucrative business , a lot of pharmaceutical companies will do their best to influence the medical conference organizers , who are usually leading doctors , who are the office bearers of the concerned medical society . Some of this can happen in fairly subtle ways , so that it's not obvious to the doctor that he is being seduced into practicing inappropriate medicine. This is going to be a very unpopular suggestion , because doctors like attending medical conferences . They like going for all expenses paid holidays , because they can justify to themselves that they are learning a lot at these conference . Unfortunately , it has been proven that lectures are a very poor format of educating someone. It’s high time we started adopting the recent advances in digital educational technology , in order to ensure that doctors keep up-to-date with recent medical advances, without being exposed to the pernicious influence of pharmaceutical marketing , which medical conferences today provide. Not only are conferences a bonanza for pharmaceutical manufacturers, they are also exploited by medical device manufacturers , who spend crores of rupees trying to convince pathologists and radiologists to buy their equipment. All this marketing ends up increasing the cost of the equipment – and this gets passed on to the poor patient . 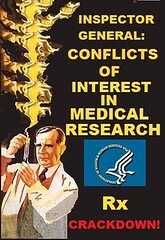 A lot of these companies justify their expenses by saying they need to earn money in order to develop new products , and invest in research and development, but in their heart of hearts they know that their money could be put to far better use , if they did not have to indulge in unethical practices to covertly influence doctors. This would give a far better rate of return , both for themselves , for patients , and for society at large . However, companies today are in a soup. Even if one company is highly principled and decides to take the moral high ground and stops paying under the table in order to influence doctors, they will be at a disadvantage because the other companies continue to do so . This is why passing the law, which provides a blanket ban, will ensure a level playing field ; and will help everyone - the companies , doctors and patients , so that limited resources are put to the most cost-effective use , and we can all get the biggest bang for our hard earned bucks. Great thinking! How man doctors will think like you?